Fully updated with the latest clinical data, including specially commissioned research, Clinical Examination addresses the core principles and clinical skills that underpin diagnosis for safe, effective medical practice. 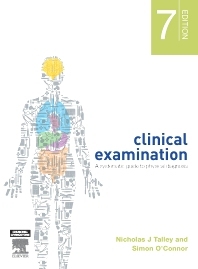 Clinical Examination: A systematic guide to physical diagnosis, 7th edition breaks down each body system into a logical framework focusing on the history, clinical examination and correlation between physical signs and disease for each system. Helping students to navigate from first impressions through to the end of consultation, the text provides a patient-centred, evidence-based approach, making it the definitive resource for anyone embarking upon a medical career.